If you have subscribed to my newsletter, you got to read the first part of this excerpt in September. 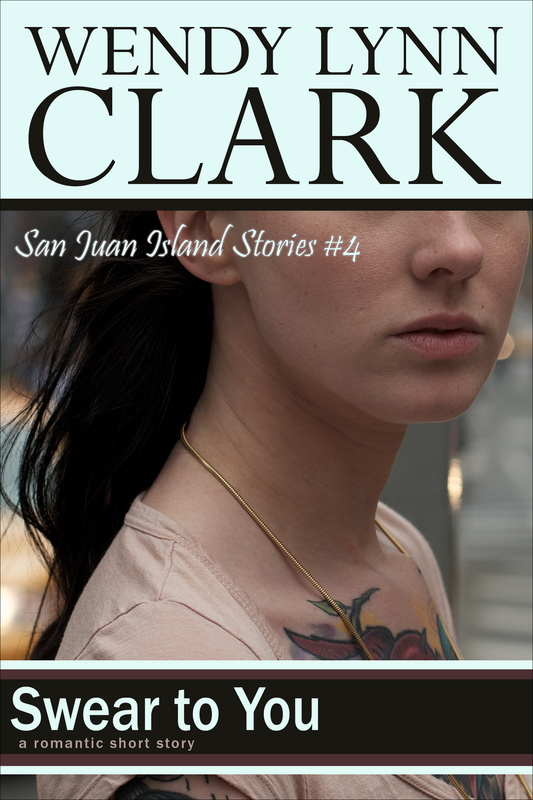 Here is the full excerpt for Swear to You, San Juan Island Stories #4, releasing November 15, 2013! Sera flew over the handlebars, somersaulted over her exploded bicycle tire, and landed flat on her sweaty back on the dirty sidewalk. Her old bicycle crashed into her apartment building flower pots. Even though the Aurora highway growled three blocks to her left and a year-round school was releasing excited elementary students to her right, the air dropped weirdly quiet, like a mountain silence after a shotgun blast. Not that she’d ever been to any mountains. Puffy white clouds bloomed into giraffe and llama shapes against the brilliant July sky. She wished she could follow them right over the horizon into a better life. Sera groaned and rolled upright. Her shins ached and she quickly realized why: The knee of her last good pair of Dockers flapped along a jagged rip. Funny how her old black fishnets and slutty tutus had stood up to the most violent mosh pits, but nice, conservative Dockers couldn’t handle even one little argument with the pavement. She did not yell, “They have to get used to it sometime!” like her dad had once done at a wide-eyed Daisy Scout troop after he dropped the groceries in the King’s Market parking lot. “You should be ashamed.” The woman slammed her door and drove off. In her sixty-thousand-dollar Audi with limitless air conditioning. Breaking into tears was not what a good girl would do, so Sera didn’t do it. Instead, she limped the useless bike into the apartment complex. She’d have to get another pair of khakis before tomorrow’s opening shift at Starbucks and her all-day shift at Kohl’s, and if she kept spending her money on stupid clothes, she would never pay back her student loans or save up for a trip around the world or finally climb Mt. Kilimanjaro. And so did her feet, and so did her palms, and so did her heart. She passed a stoned wino who seemed to be laughing at a blank wall. Even he was having fun. Clean living was not supposed to be this hard. Well, the last time she saw him at his cousin Pez’s graduation party, she had already been making an effort to change herself. Maybe she had been more successful than she had realized. Then the memory of what she had done there, at the graduation party, somersaulted her into the past. Pow-zot, she had confessed her eternal undying love to Graham, and he had thrown her right out of his life. Now, five years later, he was here on her doorstep. Her chest shifted. Pressured. Like she wanted to laugh, or sneeze, or cry. She got out her phone. Pez had just been talking about his prodigal cousin. Right after reunion officer Allison had called for Graham’s current address, Pez had gotten all sentimental, calling Sera up over and over to relive their glorious senior year. And every time they hung up on the memories they both shared, the memories she kept in secret pounded against her brain like a headache. All the ways that she had chased Graham. All those embarrassingly obvious hints he had ignored. All those leading questions he had sidestepped to the very final, inescapable, in-her-painted-punk-face rejection. Her phone slipped from her numb fingers and hit the ground, breaking into three pieces. She snapped her teeth shut. Gah, she could bite off her tongue. Another dollar in Pez’s swear jar. And in front of Graham, of all people. He dropped to his knees at the same time that she leaned over and she got the familiar, clean scent of him. White bread and fresh laundry. Plus a new smokiness, like incense. Sandalwood? His hands closed around hers. Bigger than she remembered from high school. His eyebrows rose, but he did not ask her why she was in the men’s restroom. His deep gray eyes traveled across her nervous smile. The chair he had pulled out to sit on was stacked with her various night courses, used astronomy textbooks, the manicure UV kit, a half-completed application for her bartender’s license, and readings she had to memorize for the internet priest exam. Graham set the whole stack on the floor and sat, stretching out and crossing his feet at the ankle. Feet encased in steel-toed black boots. Which was weird again. He used to wear loafers made of patent leather, with a real penny in the center. He snorted like she’d made a crude joke. About sucking. What a helpful young man. A genuine Eagle Scout. Five minutes later she was clinging to that genuine Eagle Scout’s broad, leather-clad back while the wind whipped her breath away. His three hundred-pound black and red beast roared like hell and throbbed like heaven. After they returned, while she was trying to figure out how to uncork the wine he’d bought with nothing but a dull butter knife, he whipped up an omelet with fresh tomatoes, mozzarella, and window-sill basil. He handed the lost fork to her. His fingers lingered on the stem, brushing hers. An electric shock jumped straight to her chest. She imagined the freedom of hopping on a Harley and disappearing over the horizon. What would the clouds look like over Yosemite? How would the Rockies sound when she flew up their winding roads and hugged Graham’s body to her own, pressing herself tight against him? She met his gray eyes for one long moment. Her legs shivered with the thrum of the Harley. The taste of fresh warmed basil lingered on her tongue. She hadn’t even known the plant growing in her windowsill was edible. But she would never let him get close to her again. Oh, his smile. His unforgettable smile. She needed to touch him. Needed it, like air or potato chips or water. “One. And that’s it. I mean it.” Sera put on her headphones and hit the play button. She had given up chasing after Graham with wide-spread arms. He had told her that she wasn’t the kind of girl he would ever be interested in. It didn’t matter that she was different now. He thought she was the same. Well, she would show him that she was different. No way was she going to fall in love with him again.